French bulldogs make great couch potatoes. Apartment living and dog ownership don’t always go together. Your neighbor can become irritated when your pooch expresses his natural inclination to bark, and you might be worried that your dog needs a big yard. Some breeds, however, will adjust to an apartment lifestyle quite easily. Also called the barkless dog, the basenji can be documented back to ancient Egypt. Adult basenjis weigh about 22 to 24 pounds, and grooming needs are minimal for its short, odorless coat. Basenjis do not bark but are not mute. When excited, they make a sound that sounds like a yodel. The Basenji is an intelligent, active dog bred for hunting, so apartment-dwelling owners need to make arrangements for daily exercise. This indoor dog is adaptable and even-tempered with an affectionate disposition. 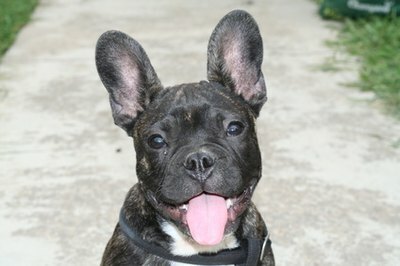 Frenchies will bark to alert their owner to visitors, but otherwise are generally quiet and are not boisterous. The Frenchie’s short coat requires minimal grooming. Puppies are frisky, but adults make good couch potatoes and don’t need much exercise. A healthy Frenchie should not weigh more than 28 pounds. The Japanese Chin was originally bred to be companions for aristocracy. Only 8 to 11 inches tall and about 12 pounds, their small size makes them ideal for apartments. Unlike many toy breeds, this dog is not normally yappy, but it can develop separation anxiety if it doesn’t get enough interaction with its owner. While they don’t need much exercise, they appreciate daily walks. This sweet-natured breed, comfort-loving breed is also quite playful and athletic. Italian greyhounds are slender and small, growing to 13 to 15 inches tall. The breed doesn’t bark much, even to announce visitors. These dogs require bursts of exercise, but once out of puppyhood, they can be quite the couch potatoes. The breed’s short, smooth coat is easy to groom and sheds only minimally. These dogs can be difficult to house train and don’t like to go outside when it’s raining or too cold.